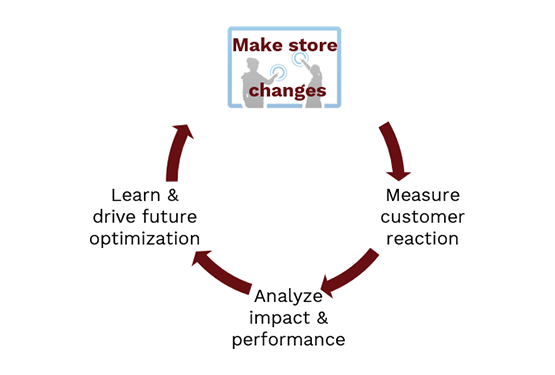 We help you translate better measurement into better stores. Analytics can support the really big decisions. Which stores to close. Where to open. The right markets. The necessary level of penetration. The relationship between on and offline. Optimize layout and design for both basket-size and customer convenience. Improve seasonal strategies. Integrate digital experiences and make them work. Improve display and promotion strategies. It’s all about analytics. Optimized labor forecasting and allocation strategies are just the starting point for analytics. We can help effectively tie Voice of Customer (VoC) and Voice of Employee (VoE) into strong feedback loops that help you optimize approach strategies, scripts and even hiring. Everybody gets how analytics can help optimize tactical stuff like store promotion strategies or Pay-Per-Click keyword buys. But if you’re not using analytics to drive the big decisions, then you’re not really doing analytics right. When is a store necessary? When is it an advantage? We use advanced behavioral analytics and a unique approach to Voice of Customer to help you make the right calls when it comes to omni-channel and store strategy. We use VoC to go beyond NPS and other scoreboard metrics to help you understand what drives shopper decisions. How friction, convenience, price, competitive sets, and customer experience combine to shape the critical moment of purchase and how different strategies will actually make a difference. VoC is great for sketching the big picture. But without a detailed understanding of what happens in-channel, it always leaves essential points a bit blurry. Part of what makes Digital Mortar unique is the way we combine pointed VoC with powerful behavioral analytics. World renowned expertise in digital analytics and, of course, the best in-store customer journey analytics folks in the world give you real insight into how shopper attitudes and digital/store experiences combine to yield success or failure. Without this knowledge, strategic decisions around the role of a mobile app, the right strategy for in-store digital experiences and the most impactful site-to-store programs are made blindly. The secret to digital is continuous improvement through incremental change. But it isn't just a lesson for digital. Creating a process of measurement, disciplined change and careful analysis will drive continuous improvement in almost anything. From your personal workouts to your business forecasting to your in-store merchandising. It's a process that just works. Sure, but how does this process actually work in the store? Analytics driven improvement starts with a comprehensive baseline of performance. We build a behavioral segmentation of your shoppers, analyze how well the store performs for each shopper segment, and baseline all the key drivers of performance – from day-time parting, to weather, to store/section density. This analysis doesn’t just provide a baseline, it generates dozens of actionable testing opportunities and sets the table for everything that follows. The Store Overview Analysis helps you hone in on the problem areas in the shopper conversion funnel by segment. That naturally leads to a set of testing opportunities that include changes to store promotion, basic store layout changes, CRM targeting strategies, new digital re-marketing strategies, and alterations to Associate deployment and interaction strategies. These get tested in carefully controlled experiments to understand what works and what doesn’t. If you learned something, there is no bad test. We make sure your tests are important and will – win or lose – help you refine your store strategy and tactics. When a test works, it becomes an operational problem. How to rollout most effectively and make sure a single store test translates effectively into the fleet. And when a test fails, we look at why. In either case, we use measurement and analytics to drive another round of changes. And again. And again. Because you can never be too good. Do you have the right team-size on the floor? No matter how sophisticated your modelers are, we can help make this process better. The data that DM1 spins off lets you drive your forecasting and allocation models down to never before seen intra-day levels and store sections. Better data makes for better models. And we can help make sure you aren’t wasting money on unnecessary staffing or, just as bad, leaving sales on the table because you’re understaffed. Our analytics helps you figure out when, where and why associate presence creates real lift and how to take advantage of that knowledge to improve operations. Professional sports teams have made a fine statistical art of analyzing which combination of players make the most effective team. We’ve done what consultants do best (steal other people’s ideas) and brought that concept to your staffing optimization. We’ll help you figure out who works best together and how to staff in ways that don’t cost a dime more but lead to more effective teams on a consistent basis. Do they have the right strategies? With DM1, we can measure stuff that people have only dreamed about. How long after a shopper enters the store is there an Associate interaction. What about by section? And, even more important, what’s optimal? Do you always want to pounce on customers? Is the strategy different by section? We take DM1 data and use it to help you orchestrate every part of the Associate Sales Strategy – along with the built-in continuous measurement to make sure the changes work and that you keep getting better. And do you have the right people? The right staffing model is such a complex question. We bring analytics to every step of the process. From borrowing yet another sports concept (WAR) to measure how valuable experience is, to helping you measure the real impact of training, the right mix of full-time vs. hourly and the right mix by team. With integrated Voice of Employee data, we can even help you find the golden questions that will help identify which potential hires will perform best on the floor. People are your ultimate competitive advantage. So making sure you give them every opportunity to succeed just makes sense.